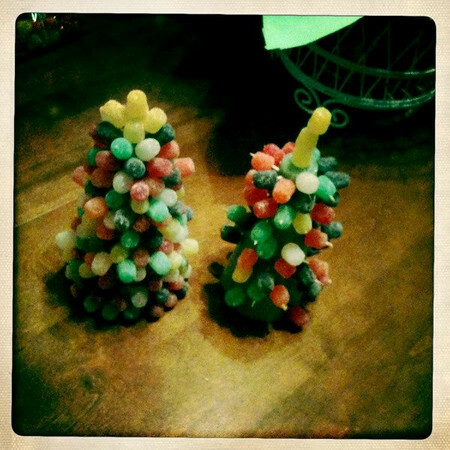 On a whim four years ago Annelise and I decided to be crafty for approximately thirty minutes and make gumdrop trees and now it's one of our holiday must-dos. This year I bought the supplies earlier in December but we hadn't sat down together to break toothpicks, impale gumdrops and poke styrofoam cones until last night. Even though she asked me numerous times,"Canwemakethegumdroptreesnowwhen,ohwhen,areweevergoingtomakethem? "she ended up only halfheartedly filling hers which surprised me. Can you tell which one is hers? On another, but still holiday related note, I must share with you some of the festive music that has been playing around here. The other day, while digging around for some of our favorite holiday movies I found our stash of Christmas CDs and looked through them like I had stumbled upon ancient artifacts or something since we rarely listen to CDs any more (unless we're in the car). We're all about iTunes and playlists now I suppose. I kept hearing about Dave Barnes this year and once I listened to a snippet of his A Very Merry Christmas album there was no turning back. So, so fun. I feel rather torn about my next fave because even though I broke up with Glee earlier this year I do still enjoy their music yet I feel guilty (hypocrite much?) admitting that. Anyway, I did download their Christmas album and yes, I do like it. Annelise LOVES their version of The Grinch song. I bought the delightful Hotel Cafe Presents Winter Songs a couple of years ago and it's still a favorite. And, finally, don't forget about the awesomeness otherwise known as Pandora.com. My two current go-to holiday stations are Dean Martin (Holiday Mix) and Six Pence None the Richer (Holiday Mix). So go ahead and check these out. Hurry though, it's the weekend before Christmas (faints dead away). What holiday tunes are playing around your house? (I'm always up for adding to my festive musical rotation, so please share!) Do you have an annual holiday craft you make with your littles? Noooooo Heather!! I didn't forget--I totally almost put that one on my list too because it IS wonderful--I need to upload it to iTunes so I can play it from my phone too--I love it! Now I have to go buy that album, as well one BooMama featured. Husband will not like this continuing addiction to Christmas music. I love, love, love Mercy Me's Christmas album. Awesome modern arrangements of classic hymns. Nicole: I swooned when I listened to the one BooMama mentioned too--Drew Holcombe and his wife--sooo fun. I might HAVE to download it. When I listen to the SixPence holiday mix Pandora station there's some Mercy Me in the mix. I really like them too. I'm not familiar with Dave Barnes, but that video and song were delightful. I love music recommendations!